The plot is labyrinthine covering, as it does, two continents and is based on half of the third book in the series, A Storm of Swords. The episodes are longer by a few minutes than the previous two seasons. Season three saw the introduction of a slew of new faces, which probably makes the show’s cast one of the biggest. As new faces emerge some of the subplots from season two have taken a back seat and Daenerys's’s growing power feels a little rushed. Concentration this season is on the machinations in Kings Landing and events in the north where an impasse exists between Rob and the Lannisters forces; an impasse which is broken by the schemes of Tywin in collusion with another. There are some stand out pairings, especially that of Jamie and Brienne and their journey south is both touching (for their growing relationship) and harrowing (because of the dangers they have to get past). Diana Rigg joins the cast as Ollenna Tyrell, who means to have a share of the thrones power for her families help in the war. This posturing and game playing is brutal. Let’s face it, one of the things fans like is that all the characters are up for being killed off and even if you have read the books this is still no guarantee that you will know who dies and when. 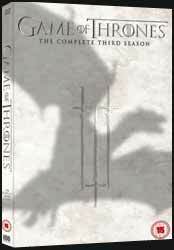 A theme which dates back all the way to the original books and season one when Ned Stark was beheaded, sparking the war which has raged for two seasons. This then is the darkest season so far which culminates in the red wedding, an event which even manages to eclipse the Battle of the Blackwater in its shock value. The show continues to be full of death and mutilation as the first generation continues to compete for the iron throne, while in the background the almost forgotten children start to grow in their power and destiny. There are a large amount of extras in the set. New Characters (9 min, 42 sec) gives a little peek at characters new for season three, as well as small pieces to camera from the actors. A Gathering Storm (14 min, 02 sec) a handy little catch up, with all the main actors, for those who may, inexplicably, start watching the show from season three. Episode two has a full length commentary from Jack Gleeson (Joffrey), Natalie Dormer (Margaery), writer Vanessa Taylor and director Daniel Minahan. For the most part they comment of what is happening on the screen. There are a few nuggets of information, but few revelations. Episode three has two commentaries to choose from: One from David Benioff and D. B. Weiss and a second from Gemma Jackson and Michele Clapton. Both are fairly technical. The first looks at the show from the aspect of production and creation, the second looks at the design of the show. Episode four has a commentary from Lena Headey (Cersei), Diana Rigg (Olenna) and director Alex Graves. In tone and content it is similar to the first commentary. Episode five's commentary comes from Nikolaj Coster-Waldau (Jamie), Gwendoline Christie (Brienne) and writer Bryan Cogman. This is a more upbeat commentary with the three bouncing off each other, having fun. Episode six offers up two commentaries, the first with Kit Harrington (Jon Snow), Rose Leslie (Ygritte) and director Alix Sakharov, who spends more time watching the episode, rather than talking about it. The second commentary has Sophie Turner (Sansa), Maisie Williams (Arya) and Isaac Hempstead Wright (Bran). With the younger cast you get a lighter hearted look at the show, with lots of laughter. Episode seven has a commentary from George R. R. Martin, who also wrote the episode, and director Michelle MacLaren. It's one of the more technical discussions, which is unsurprising given that it is the writer and director discussing the show. Episode eight has contributions from John Bradley (Samwell), Hanna Murray (Gilly) and director Michelle MacLaren. The last disc in the set has a collection of deleted and extended scenes (13 min, 53 sec) - five in all, two extended and three are deleted scenes. Inside the Wildings (6 min, 21 sec) provides an introduction to the Wildings, with contribution from Martin and a selection of actors. The Politics of Marriage (8 min, 39 sec) once more Martin shares his thoughts about how marriage and politics are intertwined in the show, with contributions from crew and cast. There are two commentaries for episode nine, the first with Richard Madden (Rob) and Michelle Fairley (Catelyn) and director David Nutter, the second has weapons master Tommy Dunne, sword master C.C. Smiff and stunt coordinators Paul Herbert and David Foreman. If you somehow missed the series do not start here, as it contains ‘that wedding’ and if you don't know what I mean you have a surprise coming. The show wraps with its final commentary for episode ten with Emilia Clarke (Daenerys Targaryen), Iain Glen (Ser Jorah Mormont) and Iwan Rheon (boy). This really is an essential purchase, the show continues to be superbly written. There is not a weak actor among the vast range of characters and the CGI and location work make the show visually rich.